Log in to the Smith Alumnae Directory. Once you are logged in, click on Library Benefits (left-hand column) for instructions. Visit the Smith Athletics website for alumnae benefits. Please obtain a Smith OneCard to purchase a gym membership. Visit the museum website to find out about hours and exhibitions. 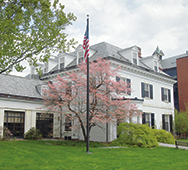 The Smith College Conference Center is available for private functions. Visit the Events Management Office website or call 413-585-2669 for more information. To audit a course, you must complete an audit form, which is signed by the course professor and submitted to the registrar’s office with a fee. It is $50 to audit a lecture course, or $200 for beginning language and performance courses or any course with a lab component. See the online course catalog. Visit the registrar’s website for more information. Located in the lower level of the Campus Center, the bookshop sells textbooks, school supplies, college apparel and mementos. Some items are available for online purchase at the bookshop website or by calling 413-585-4140.